Interview based podcasts are an extremely engaging kind of podcasts…so long as you don’t hit that awkward silence. Experienced this situation ever? One of the biggest reasons this happens is when you’ve run out of topics for the podcast interview, or if you are just wondering how to ask a question in such a way that the guest finds it interesting. 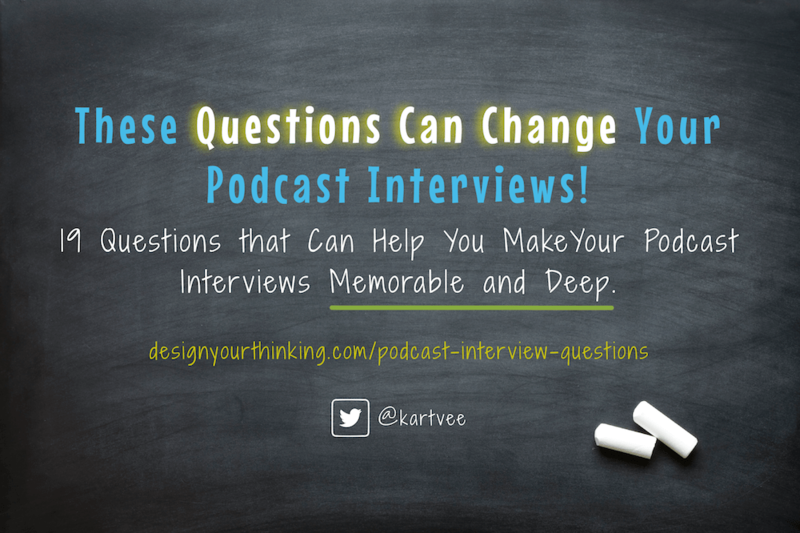 What is *one* podcast interview question you really love asking? Why? I have a deep love for great questions, and like I described in this article, two of the ingredients of great podcast interviews are great questions and rapport. To understand that *one* question that people use to have great podcast interviews, I asked one question to the members in the Podcast Movement community on Facebook and also in a couple of podcaster communities and forums. The result was over 150 podcasters sharing the favorite podcast interview questions. In this article, I just want to share 19 of my favorite questions and also a 5-step process to come up with great podcast interview questions. 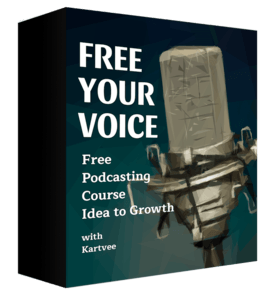 You can find the complete list inside the ‘resources’ section of Free Your Voice, my free podcasting course. I hope you find these questions useful, but more importantly I hope you put them to good use. In order to make this list usable, I suggest you write them down (not copy+paste into a text document) and reflect how this might be usable in your show. Next, write down the possible paths it could lead you to, with your kind of guests. Remember, not all of these are suitable for every kind of show. Please make sure you only pick the ones that your listeners will want to ask your guests. To make it a little easier on your eyes, let me split the list into two parts. What’s something people seem to misunderstand about you? Tell me about a patient that touched your heart, and tell me about a patient that changed your practice. What would you pick for a last meal? Do these questions give you some ideas? “Yeah, but I’d like to think of my own unique questions”. If that’s you, here’s something just for you. How to come up with great podcast interview questions? Here are 5 things you should consider doing before you start to see some really good questions flash inside your head for your podcast interviews. Write down what your goal is, with the interview. Jot down the questions you have about the guest or what they do that’s on the top of your head. Make a list of everything the guest does (or interested in), apart from what they primarily do. Write down a list of things you’d like to personally know and learn from the guest. Think from the guest’s perspective. Why are you doing this interview with this guest? It could be that you are doing this because you like them? Curious about something they’ve done? A celebrity you’ve always wanted to interview? What is it? If you aren’t sure, you must read my article on outlining your podcast, where I describe, in detail, how to get super clear about your show. Now, write down the goal for this interview. Assuming you have a clear answer to the ‘why’ above, write down ‘what’ you want to achieve by the end of this interview. The clearer you are about your goal, the clearer you get about the questions that will take you to that goal. Now that you have a clear idea of ‘what’ your goal is, and ‘why’ you are doing this interview, write down all questions you have at the top of your mind. If your guest is a cricket player (or a baseball player), you probably have questions about a recent game or a particular shot or something. Write them down. Now you’ve probably done your research by now. What does your guest like or hate? Ideally, try to steer away from their primary profession related interests. For example, the world famous Indian cricketer Sachin Tendulkar wore old pads that sometimes had patches over torn areas as he was a little superstitious. Now those are interesting angles to pursue. Wearing the ‘me’ hat always works best. Assuming you are a great representation of your audience or listeners, asking questions so you can learn something is like directly serving your listeners. It’s a great idea to switch perspectives and think from what your guest wants to achieve from talking to you on your podcast. Why are they on your show? Perhaps they are actively promoting a book they wrote, or maybe they have a podcast too. Asking questions related to their book or podcast or the topics they cover can be a great way to dig deeper. A tip here is to connect those topics to the topics of your show and what your listeners are interested in. Check out this interview I did with John Sanei where I do just that right in the middle of the episode. Is it a Conversation You’d Eavesdrop Into? End of the day, a good podcast interview is one that you will want to sneak into and listen even when you are not invited to listen into. In short, the questions are such that the answers are worth listening to. They either teach, inspire or help you get unstuck. Hope you found these questions and the techniques helpful. Go ahead and give them a try. If you are more interested in the art of podcasting and interviewing, sign up for Free Your Voice, my free 4-week podcasting course. If you found this article useful, leave a comment below and tell me one question you came up with. Or, if you think you have a question I must consider for another post on this series, leave that question in the comments below.